The eventer has been out twice to work with baby Luxxx thus far. He did wonderful both times and the last time (Saturday) she said the next time she wouldn't work him on the lunge first and just planned to get on. She was due to come back Monday at 6pm. I rushed home from work and had him tacked up and waiting. And we waited. After 30 minutes of my 3 year old somewhat patiently standing in cross ties I texted the eventer and said it was gettting late and I still had Poppy to ride so we needed to reschedule. Apparently she thought 6pm was more 6ish and she could come sort of whenever. No. I work full time, have horses to ride, a barn to clean, animals to feed, sleep to get, and I don't know...maybe spend 5 minutes with my husband between that. So she said Tuesday she would be there at 6. 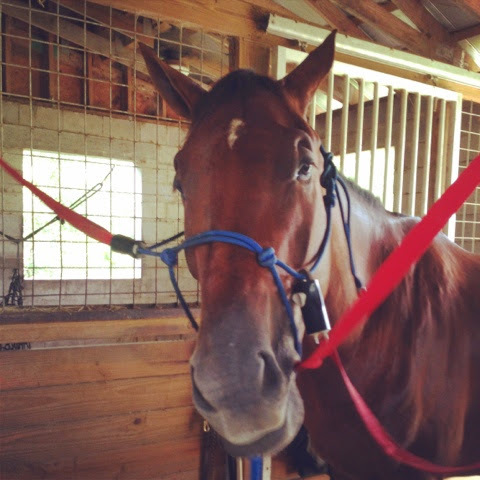 Horse was tacked and waiting and at 6 she texted and said she can't make it. Sooooo on to plan b. I'm deciding what plan b is. I can send him off for 30 days training (at a cost of about a grand) or I can do it myself. Right now I am leaning on doing it myself. My only reluctance is that I ride alone so if something happens...I am also not opposed to giving a small sedative the first time I get on. 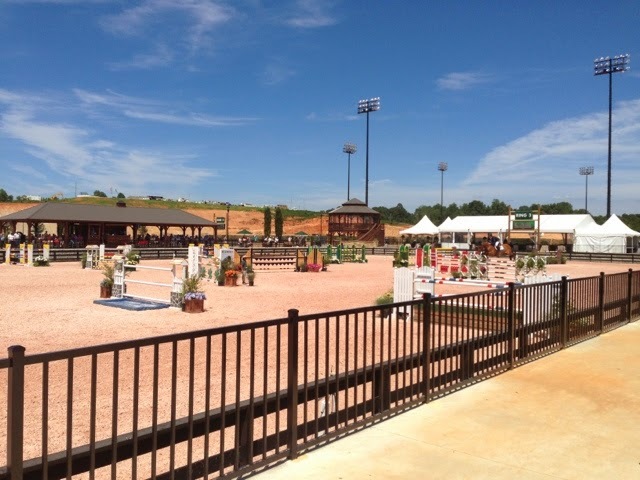 When I got to the Tryon show in July I realized I forgot my sunscreen and it was forecasted to be in the 90s. Being of Scandinavian decent I am very fair skinned and burn easily. 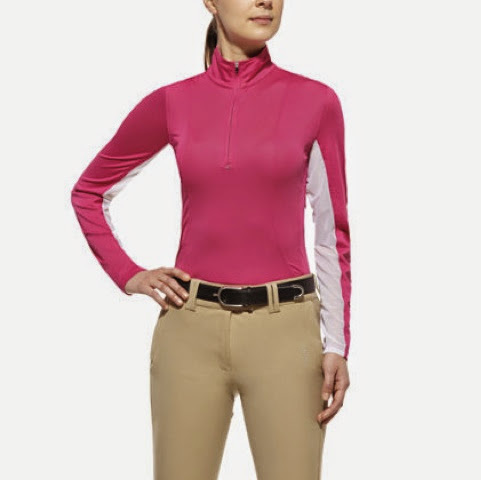 I fortunately brought along an Ariat Sunstopper shirt that I had purchased on sale at a tack store (about $30) but had not worn. I loved it. It kept me cool and the sun off of me. What I don't like is that EVERYONE wears these things and that's all you see outside the hunter and Eq rings so they are not very individualized. 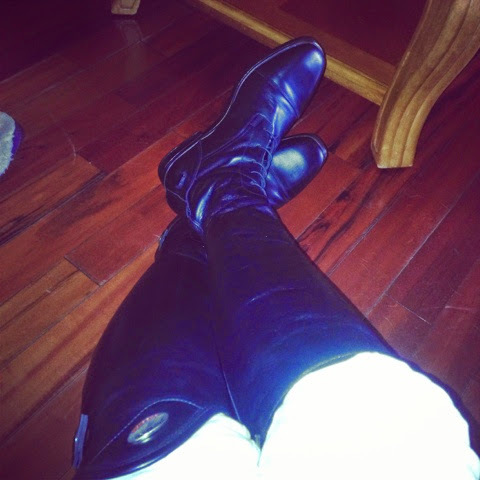 Most people wear the more expensive ESI ones ($80) so at least with the Ariat I'm not looking like twins with every other person. 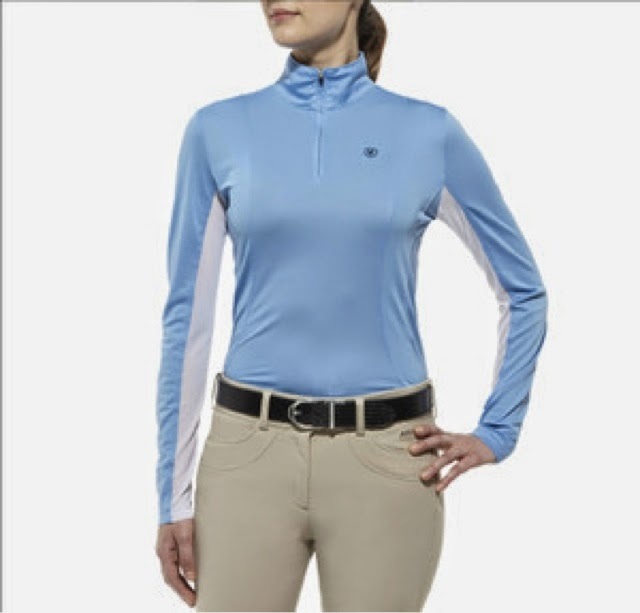 I liked this shirt so much that I went to one of the mobile tack stores and bought another in blue. I forget how much I paid, but in the $40s. They are $49 at Dover. Selfies are a skill I do not have (thankfully) so this is my best attempt to show you how they look in a real life photo. I would definitely recommend this shirt. It kept me cool, it has the arm vents, it kept the sun off, it washes up nice, fits true to size, and it's priced affordably at under fifty bucks. Even better if you can find it on sale like I did the pink one! 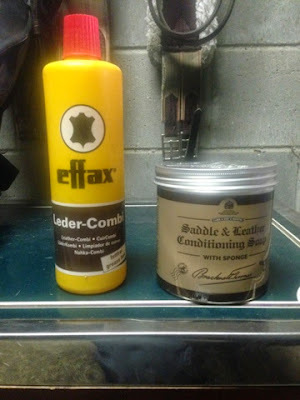 I am always searching for the best leather cleaner to use. I am not a fan of the glycerin stick and definitely will not use it on my saddle. Upon recommendation of others I bought Effax. I had been using it for months and thought it did a great job cleaning. It really does get all the grime off your tack. I soon noticed my saddle was looking really worn and dry. 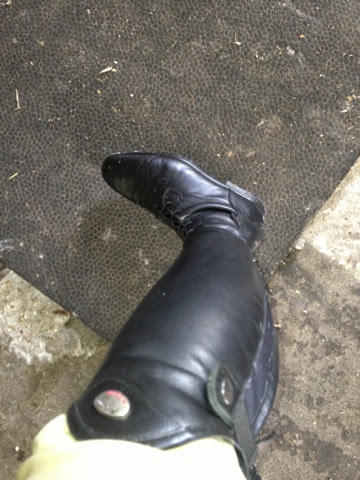 Several times a week after I clean my tack I condition it. You could not even tell on my saddle. I bought some Antares oil to try on it and it didn't help. I was starting to think it was maybe time to think about a new saddle. I was literally watching my saddle go to crap every time I rode in it. Never once did I think it was the cleaner I was using. While shopping in Tryon I needed more cleaner and came across a cleaner I had not tried before. Carr & Day & Martin soap is amazing! 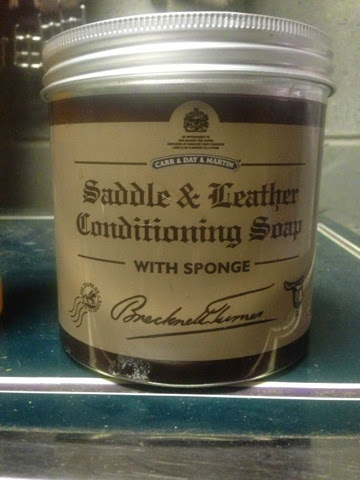 It smells good, comes with its own sponge, and my tack gleams again! My saddle is completely revived. Priced at about $15 it's pretty reasonable and comes in a large sized canister. I will definitely purchase this again. 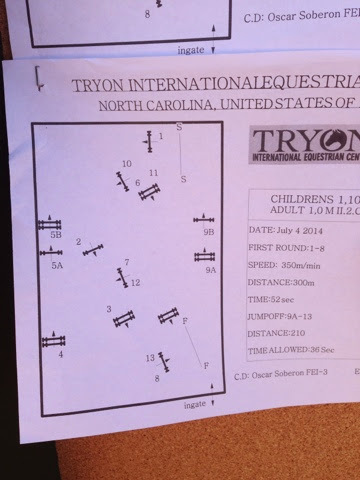 I finally remembered to download the one video I have from Tryon. This is the jump off from the NAL classic. Friends took other video but I haven't gotten them yet. My mistake in the jump off is pretty obvious. I should have kicked and taken the long spot to the vertical instead of chipping. I asked Poppy to jump from under it and had a knock down. That what I call an oops. Last evening I brought Luxxx over to M's. he worked baby L while I rode his mare. 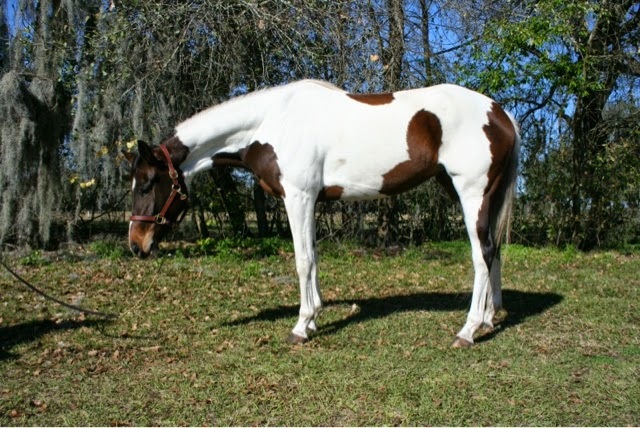 She is a 4 year old Oldenburg x TB pinto. I haven't put a stick on her but would guess she is 15.3. M broke her and wants to sell her as a hunter or jumper prospect so I am teaching her to be an English horse. M does a great job starting his horses so she has an amazing foundation. She is very broke for 4yo. She goes in a frame, bends, and his lateral work is spot on. How many 4 year olds do you know who leg yield, turn on the haunches, and turn on the forehand? Baby L was pretty good too. 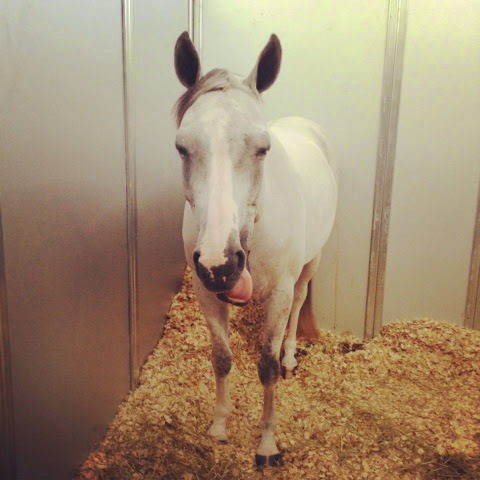 M said when he worked him in the round pen he starts out being silly and bucking which M doesn't like. He says he needs to go right to work. I think this is just L's lack of maturity and it really doesn't bother me. The fact that he gets it out of his system and doesn't do it with a rider is what I focus on. needs to stretch but they are getting there. looking boot. No, actually they are beautiful. more times and give you my full synopsis. my show bag and wait for the next show. Last evening the eventer came to evaluate Luxxx. She started out by lunging him and teaching him voice commands (uh oh M says no voice commands). He was bratty baby a few times and definitely showed his poor attention span but he tried hard. Next she got on and had me keep him on the lunge. He was quick at first but soon relaxed and was a slug. Every time she asked him to stop he immediate listened. Last she had me take him off the lunge and she walked him around in a serpentine. He was calm and didn't do anything silly so we let him be done. Overall I was really happy with him. She said she liked him and thinks that working him at least 4 days a week between M and her should have him where I will feel comfortable getting on. She plans to come ride again on Saturday. I am hoping to get to M's today. 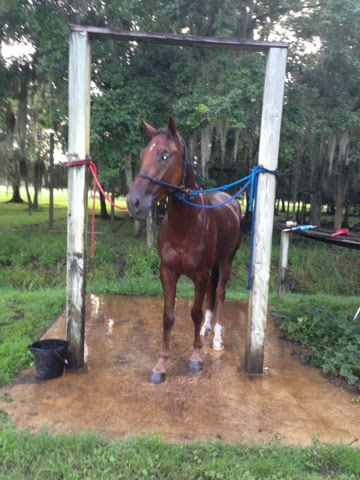 He will work Luxxx and I will work a young warmblood prospect he bought and has been breaking. I am not a fan of paints but she is super sweet! I think she will make a cute jumper and might show her next month. Anyone looking for a new horse??? What is the best advice you've ever received from a Trainer or another rider? What is the worse advice you've received from a Trainer or another rider? The first time I rode Hobbs my trainer at the time told me not to try and change him. She said he goes the way he goes, he knows his job and does it well. I would need to adjust my riding style to him. Very few people were able to ride him successfully due to this. I listened to her and Hobbs and I had a successful career. 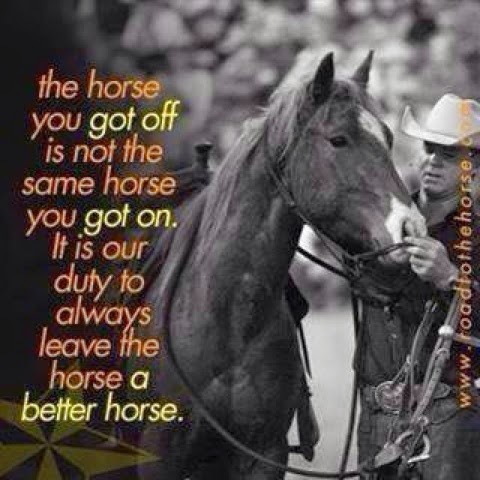 I learned to apply this to other horses though. Why do we have to change them to fit the way we want to ride? 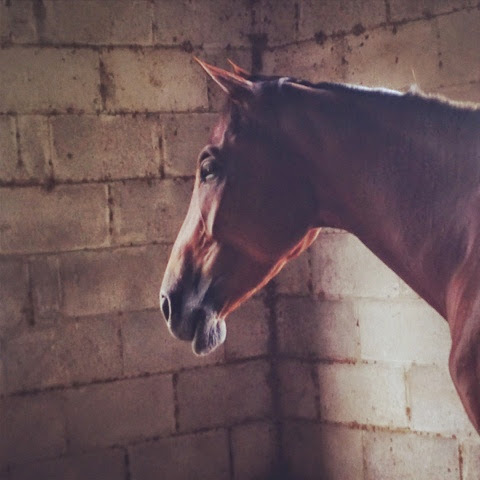 We should be adjusting our style to what makes them happy and brings out the best in our horse. I have been thinking about this and nothing in particular stands out. I have things I don't agree with that my trainer has said such as a horse's breeding doesn't matter. Or we may disagree on a horse ie she told me not to buy Poppy. But I can't really think of worst advice. I can think way way back to my days of boarding and disagreed with BO's on horse care. Advice is just part of this industry. You ask 5 people the same question you get 5 answers. You educate yourself and you make the best decision you can. If it doesn't have the best outcome you learn from it for next time. I am traveling this week so there won't be any riding for me. Poppy deserves some time off anyway. When I return I plan to focus on getting Luxxx going. Taking Luxxx to M's once or twice a week is just not enough. 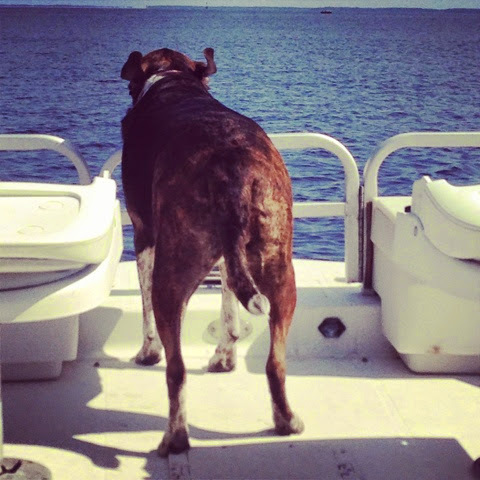 I am not comfortable riding him alone at home yet. I just don't have the time to trailer him there anymore than that though. I found a girl who events and also breaks young horses who will come to me. 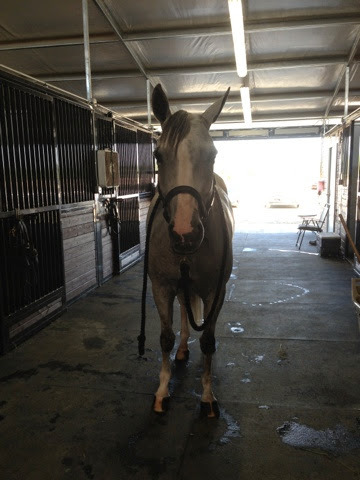 I plan to still take Luxxx to M as he is super with him and then adding the eventer at my house a couple times a week. I figure by doing this for 30 days should get him to the point where I can take over. M had a great ride on him last week and says he jut needs to be worked more and he will come together. There is a local unrated show at the end of August I plan to take him to. If nothing else, he can just go hang out and get used to the horse show life. It's an inexpensive show so perfect for this. About 160 miles into the trip I heard the dreaded BOOM! It's a sounds like the rear of the trailer has been rear ended. My passenger side rear tire on the trailer blew. I pulled over and checked. Yup, blown. We were about a mile from an exit that I had remembered having a Goodyear near the Pilot Truck stop. I limped off the interstate and pulled in. They of course did not have my size tire. No big deal, I brought 2 spares. $15 later they changed the tire for me and I was on my way. About 30-45 minutes later I heard the noise again. I pulled over and the spare we just put on blew. I got off at the next exit and pulled to a safe spot so my friends and I could change the tire. Thankfully my husband packed me everything I would need and a quick lesson before I left. We changed the tire and asked around if there was a tire store anywhere. Someone said there was a Walmart a couple exits down. I had my friend call them, they said they had my tire and told us the exit number. Of course it was the wrong exit they told us so we passed it. I had to go 10 more miles away to get off and back on the interstate. We got to Walmart and found they did not have my trailer tire. I figured we would go on down the interstate and try to find someone who did so I could have at least another spare. As I was pulling out of Walmart the spare blew. Seriously. I have the best AAA you can get including trailer assistance. They were NO HELP and said the closest tire place was a couple hours away. They said it would be hours before they could get someone to us. My husband said just tell Walmart to put any tire that fit on the trailer so we could get home. But of course they had nothing 16 inches. We were screwed, it was a Sunday, and it was about 6pm. One option was to get a friend of mine to come get my horse and try and get tires in the morning or have my husband bring me tires. A friend texted me a website of lay over barns. At least then I could get Poppy off the trailer and in the morning unhook and find tires. Of course all the barns were full. One lady offered to call a truck stop for me and see if they had my tires. 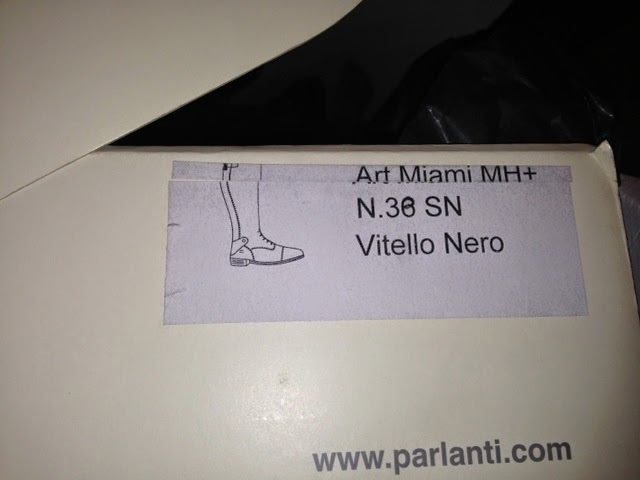 They did but they couldn't get to me until midnight! So this kind lady came and picked me up to take my blown tires to get replaced. Horse people are the best! The truck stop only had one of my tires. One was better than none. While they were mounting it, my friends who stayed with the trailer called and said a guy who came to shop at Walmart saw my flat and came over to see if they needed help. He owns 6 tire stores and has emergency road side assistance so he could mount my tires there. Perfect! Get me 2 more tires so I can have 2 spares to drive home with! Now why couldn't AAA find these places??? I asked the truck stop about my blown tires and they said likely just due to the upper 90 degree weather and crappy South Carolina roads. The sweet horse lady who took me to get a tire refused to take any money from me. She went shopping at Walmart and even checked back on me to make sure road side assistance came. They did. When they pulled my blown tire off the trailer we saw it had a puncture. I must have run something over. By 10pm we were back on the road. We were half way home at this point. Poppy handled it all very well. At Walmart I was able to open her stall divider to let her stretch and hung her a bucket of water. She had plenty of hay. It was really hot so I tried to sponge her down too. I always feed bran mash with mineral oil before long hauls. This is why. I'm not going to lie, I was white knuckled the rest of the drive home and I went no faster than 55mph. I have hauled alot but now it was dark. Pulling over in the dark if there was an issue and not being able to see my tires in the mirrors made me nervous. I did a lot of praying. It was after 3am when I pulled in the house. Poppy was fine. I bran mashed her again and turned her out. Turn out is always better for them. They tend to drink more and the moving around is best for her legs. 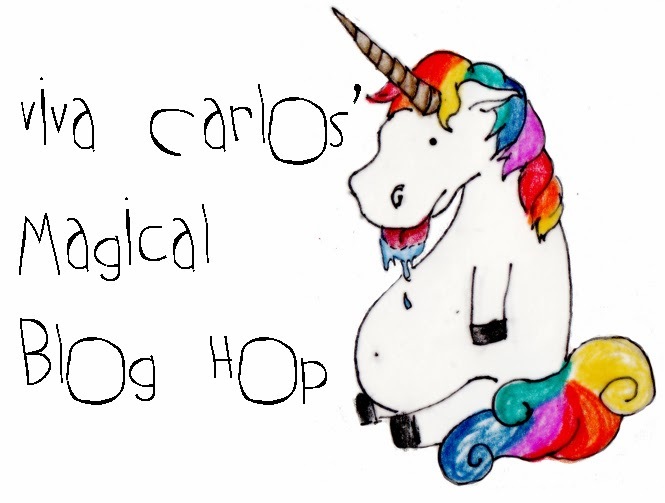 Plus her pony was screaming for her. I had been up for almost 24 hours by the time I got to bed. I was very thankful to have made it home safe. Though it was a trip from hell home at least I was near an exit each time. Also I was reminded that there are still good people in this world. It was also great to know I had friends who were willing to drive 200 miles to come rescue me if need be. As if the situation wasn't stressful enough, I felt like the friend that was with me blamed me for the tires blowing, complained about needing to get back, then slept the rest of the drive versus helping me stay awake. Be thankful for great friends who will drop everything to help and count your blessings that you are safe in a crappy situation. 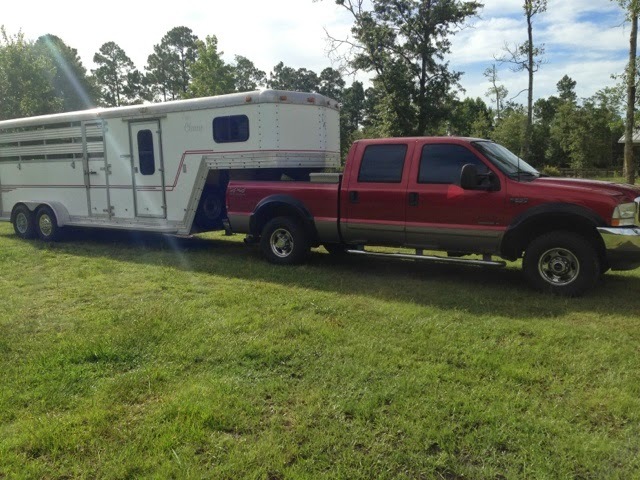 For those of you that want to haul your own horses remember this story. I still had a great time horse showing. The facility is fabulous. 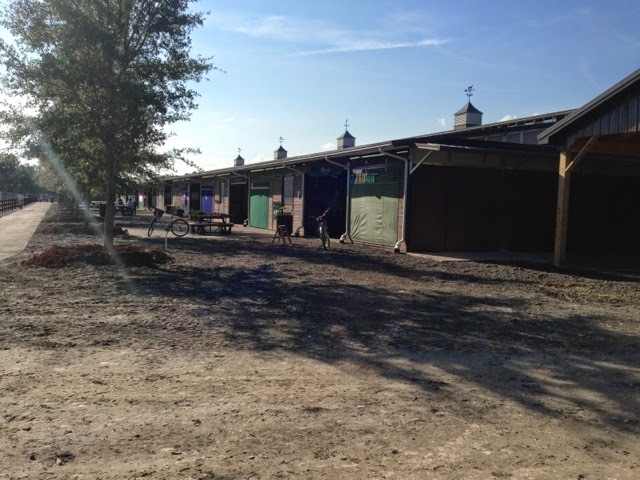 Horse trailer parking was cramped but maybe they will expand that, the place is still very much under construction. 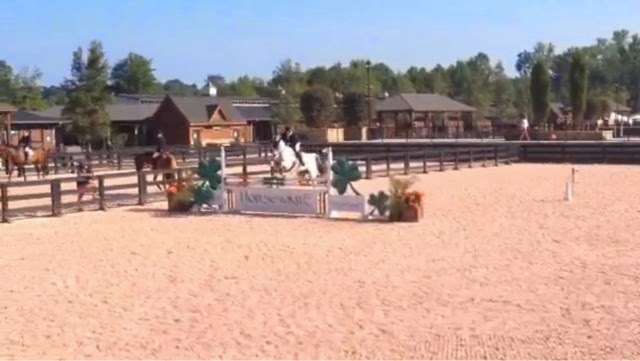 The warm up rings are a small compact area in front of the ring you are showing in. It made it hectic when it was crowded but from what I hear indoors are way worse so I reminded myself it was prep for that one day! 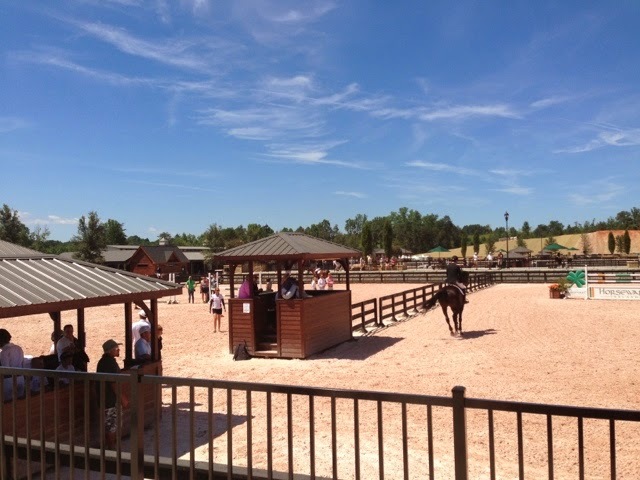 Sunday was my last day at the Tryon International Equestrian Center. My trainer stayed for the next week of showing but I had to get back to reality and the job that pays for this obsession. I also insanely missed my baby moose Luxxx and the dogs. Husband too of course! 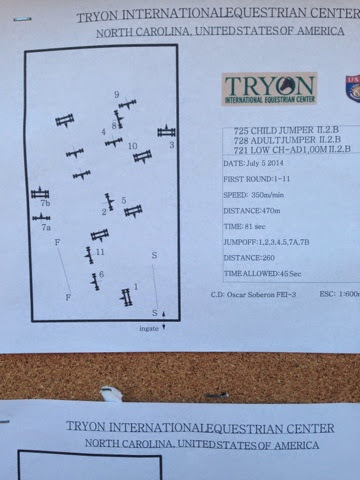 I was 7th in the order of go for Sunday's $5000 NAL Child/Adult Jumper Classic. The course was tough and I was anxious to see how the time allowed ran to see if it was tight or I could take my time. After watching a couple go I could see that the time allowed was generous which meant I could save the inside turns for the jump off. 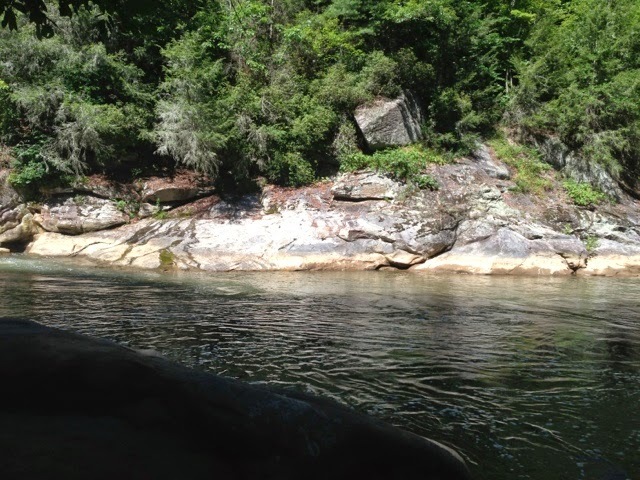 It was a table IIa which meant we would jump off later after everyone completed round 1. Poppy jumped clean and was very good everywhere. Jump 4 was right at the ingate which can be distracting but she didn't care. She has really gotten to the point where she walks in the ring and knows her job and has fun. We were 7th again in the order for the jump off. I planned my short course of turning inside everywhere and being quick and tidy. Turning inside to jump 2 put it at a weird angle and instead of kicking out of the turn and taking the risk I pulled and chipped so we had a rail. She was perfect in my opinion though. I was very proud of her. We still ribboned and came in 8th. Some friends took video but I forgot to upload it (bad blogger). I did snap some pictures off the video. 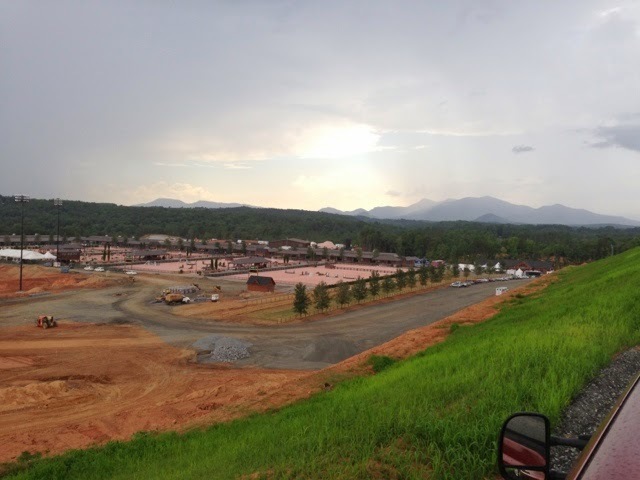 The quality is poor but you can see some more of the facility at least. Ok, I know this next one is blurry but I have to share. 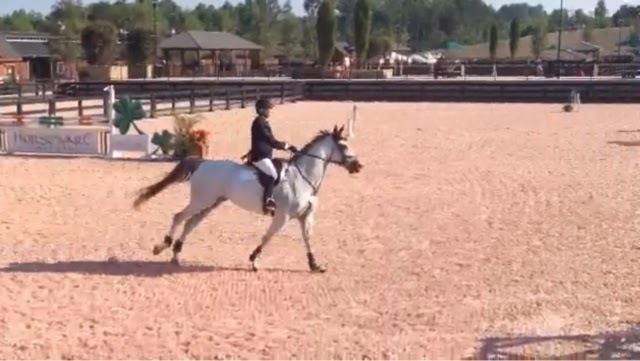 Poppy flicks her tail over the jumps and it is one if my favorite things about her. 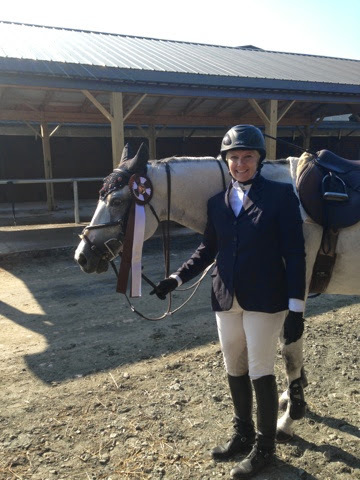 I was thrilled with my little grey mare. I just love her to pieces. Even though we had some rails she was great and I just need to work on giving her a better ride. 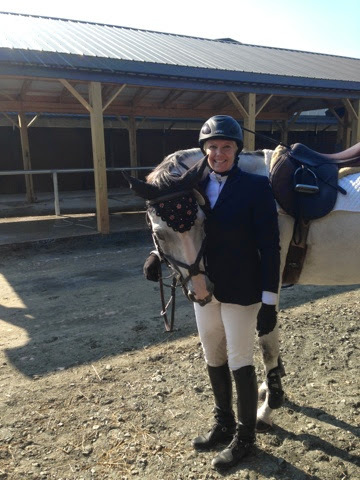 I rode early on Sunday so I was excited to leave the show and head home before noon. Unfortunately I had the drive home from hell. I will drag this thing out for one last Tryon post and fill you in on my trip home and final thoughts on the show next. Poppy seemed to settle in at the show without issue. She was really pleased that there was no place for me to hang her slow feeder hay net so she could freely gorge on her hay. I was scheduled to show in the 1.10m high adult jumpers Friday afternoon so I hacked Poppy early Friday morning. 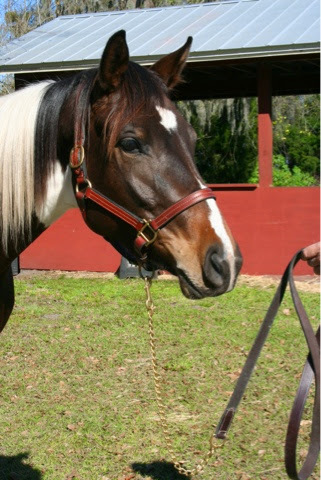 I worked her in draw reins to work on softness, bending, and getting her loose. She was great. We hacked in the very small jumper warm up area (my only complaint) and also in an empty ring they had behind one of the barns. We showed about noon. Friday was our power and speed class. This means that if you are clean and within the time allowed during the power phase you can continue on in the course to the speed phase. If not, you are buzzed out. Fortunately my barn mate when before me and I got to see that the time was really tight. We jumped clean through the power phase and I had her flying in the speed phase. I went for it to the last jump and was just a bit flat and strung out so she pulled a rail. Good enough for 7th though. 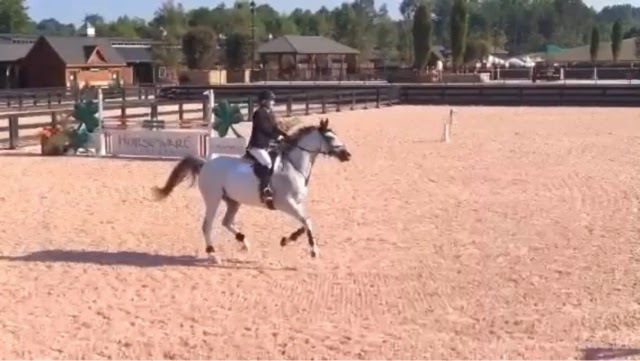 I was still thrilled with her for walking into a ring she's never been in, construction going on everywhere, and she jumped around 1.10m without batting an eye. I just did one class Friday. It was July 4th so at the end of the day we hurried back to the house to shower and go celebrate. Saturday my class went early. 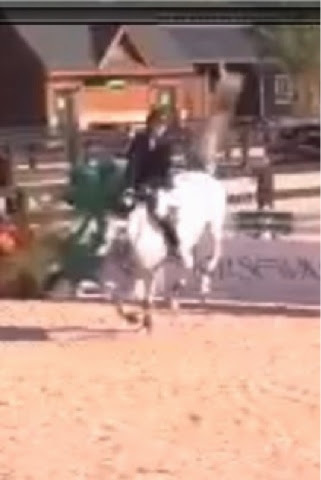 This time it was in the Grand Prix ring. It was a table IIb so we had a first round then a jump off. This ring was a bit intimidating with spectator seating on both sides. When I walked in the ring I let her see as there were jumps on the rail and I didn't want her to get surprised by the people. 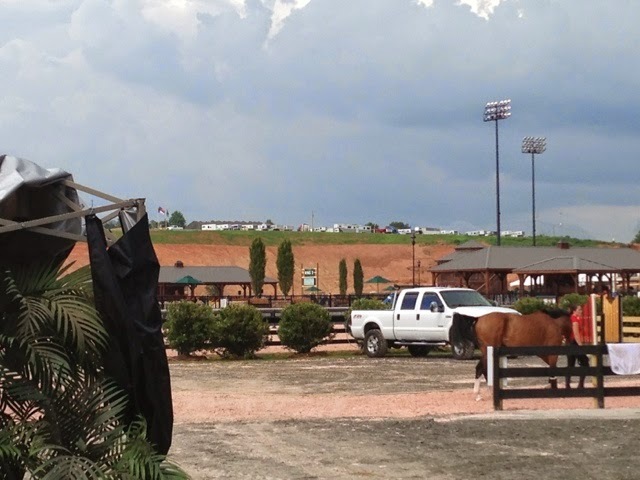 I showed her the liver pool as well which was under a big oxer on the rail (fence 3). For whatever reason she always rears when I show her the liver pool. I had a rail in round 1, want to guess which jump?? The liver pool. My trainer says I spooked at it lol! I saw a long distance and thought it was too risky so I pulled to a chip. Oops. She was great though. She jumped around fantastic and was very rideable. 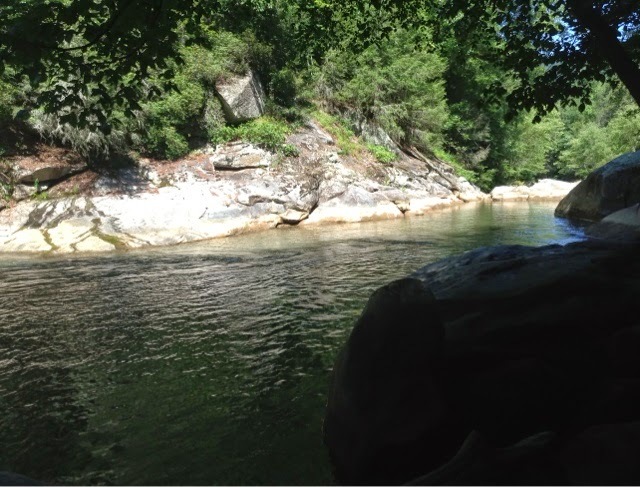 We decided to go relax at the river for the rest of the afternoon. So much fun stuff to do there! Next I will update you on my last day of showing and my trip home. 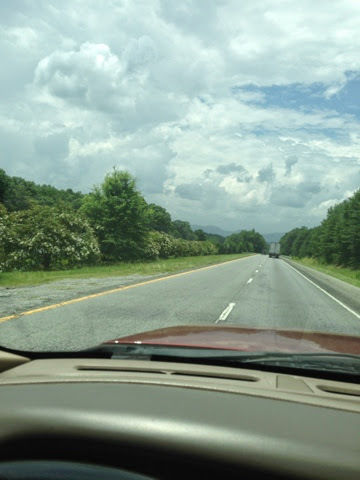 I spent 7/2/14 packing, riding, and getting myself and Ms. Poppy ready for our 7.5 hour drive to horse show in Tryon, NC. 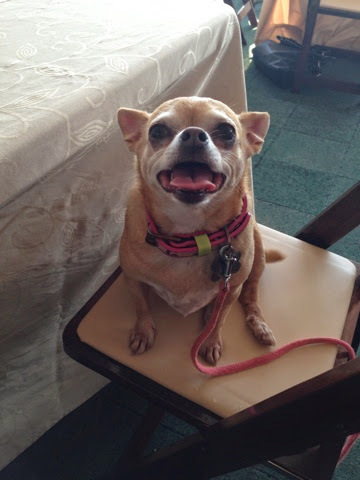 After checking my list multiple times Mini Nugget (my horse show loving chihuahua), Poppy, and I left at about 5:45am 7/3/14. A friend of mine whose daughter shows with my trainer rode up with me so I didn't have to drive alone. 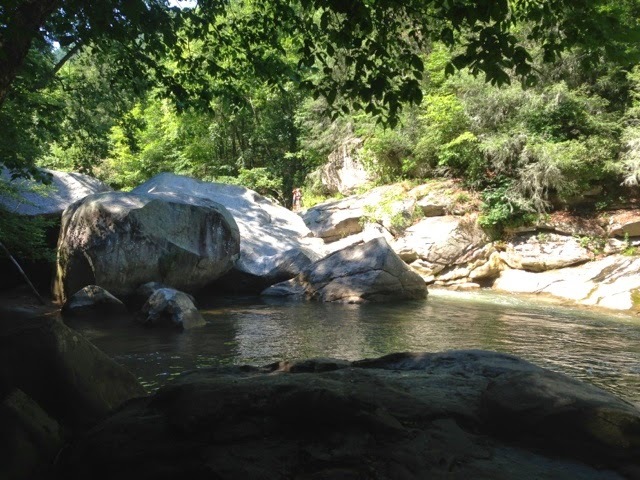 It was a fairly uneventful trip there and we arrived just after 2pm. I spent the rest of the day unloading and bathing Poppy. They had a lovely Welcome dinner overlooking the Grand Prix Arena that I went to the first night. First off the facility is fabulous. It is very much under construction but when it is done it will be first class. 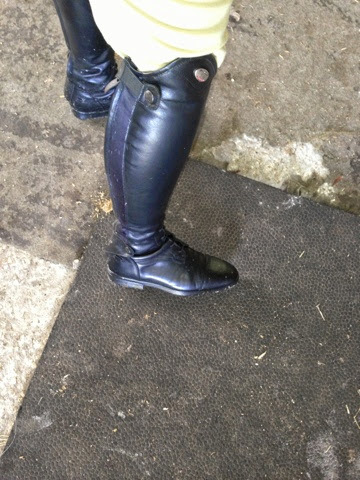 The footing was the same rubber fluff they had in the new Grand Prix arena at HITS. 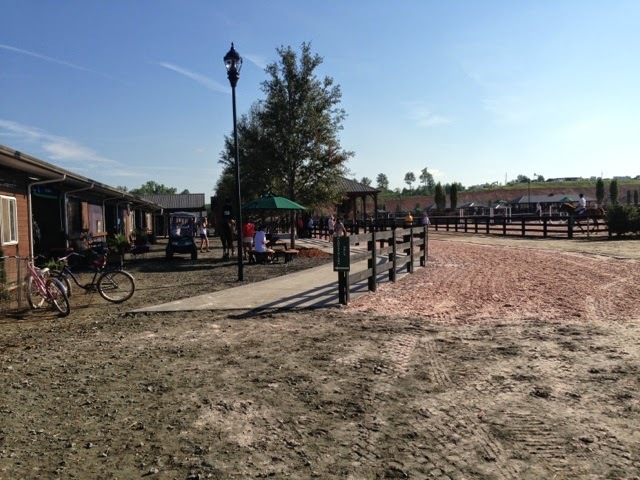 The stalls are permanent with rubber matts and the barns are first class. They are still building more rings including an FEI ring and a grass ring. There are spectator walk ways between each ring with shade, picnic tables, high top chairs, and fans blowing cold air. Top notch all the way. Next I will fill you in on how we did at the show! I know. I reverted back into the quiet abyss. I'm off from work today and had a minute to post an update. 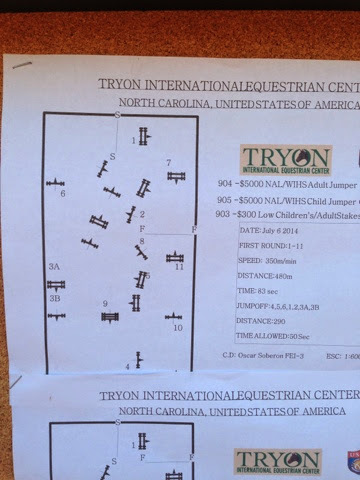 I am excitedly packing to get ready to leave for Tryon, NC in the wee hours of the morning to go horse show. It is a long 7 hour trek but I hope it will be worth it. We have a tropical storm brewing off the east coast so I am crossing my fingers and toes that it goes away! I've gone to this show a few times over the years and it is fabulous. This year it is at a new facility and I'm not sure if I am excited or disappointed. The old facility had history. The new one is...well just watch. 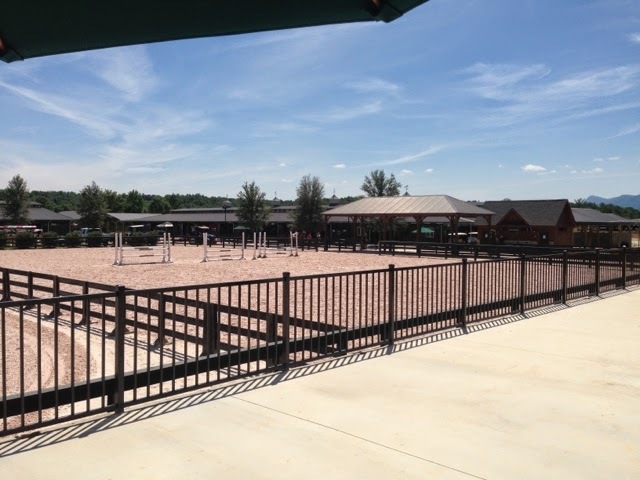 They literally just finished the barns and rings. The rest is still under construction. I will give you the down low when I get there though! I will be showing Poppy in the High Adult Jumpers Friday and Saturday and the NAL Adult Jumper Classic Sunday if all goes as planned. I will take any positive vibes for a safe journey and no rain that I can get! Have a wonderful rest of the week and I will try to update from the show if I have any service.